Buckeye Belle is one of the deepest red peonies available, with demi-double velvety flowers and golden stamens. Very strong stemmed and prefers rich and fertile well-drained soils. First bred in 1956, this Peony won a gold medal from the American Peony Society in 2010. The flower color is such a deep red that it brings out the reds in many purples, and looks great with ‘Caradonna’ Salvia and purple iris. Also pairs well with early spring yellows. 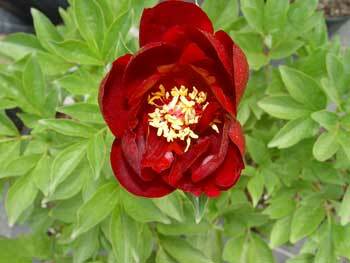 Makes a great planting with ‘Festiva Maxima’ Peony.